This next color is another color I passed up on many times at the drugstore. When I finally purchased it and put it on, I had one of those "doh!" moments. I wish I had realized how amazing this color was sooner. Again, I'm a definite fan of Sinful Colors. Great selection of colors for an amazing price. Rise & Shine is a bright leaning toward neon teal with a subtle silvery shimmer. Fantastic color! This is bright, but it's not blinding. The subtle shimmer is a great touch. This polish is creamy and applies like butter. Perfection. A great polish color, amazing application, and dirt cheap! I love teals. I think these types of colors look great on all types of skin tones. looks like turned up turquoise by china glaze... pretty color! I love this color! Great swatch! Ooh, that is gorgeous! It reminds me of China Glaze Turned Up Turquoise (as fashionpashion said), but they're not the same - just in the same family. 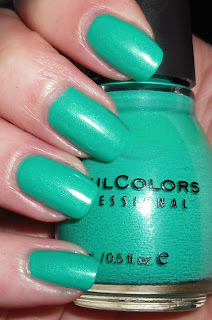 I also love Sinfull colors and that teal looks rly nice, i will look for it. This is my only SC polish, and I love it so much I want more! This is one of my favorites!!! It's incredible. I love Sinful. I love the color, and your nails are absolutley PERFECT! I wish I had your nails! this color is amazing. weird name though.. when i hear/see "rise and shine" i think YELLOW. Zara- Yeah they definitely are similar as far as color. It think it's shimmer in them that's diferent! TV- Glad you like it! It's becoming a favorite of mine. LadyLuck- I hope you can find it. It's a great color. beachbumbeauty- SC are great! You should definitely get more colors! Lovely Addison- Haha, I don't care for bandwagons either. It's a great color though. Callie- Aww thank you. This was a rare occasion. I'm usually not so great doing my own nails. Twister- Yes this is a must have I think! Amanda- Thanks! I know the name doesn't suit the color. That is a pretty typical of SC..they name their colors really strangely!